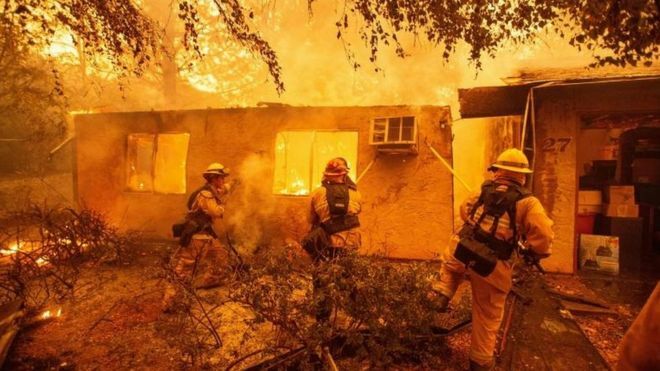 A Californian energy firm has said it plans to file for bankruptcy protection as it faces huge costs from last year’s wildfires. Pacific Gas and Electric Corporation (PG&E) said the fires, which devastated huge areas of California, had triggered “significant” potential liabilities. Reports say the company could face costs of up to $30bn (£23bn). In November, the most deadly fire in Californian history began in the town of Paradise, killing 86 people. PG&E, which serves 15 million Californians – almost 40% of the population of the state – warned then it could face “significant liability” beyond its insured amount if its equipment was found to have caused the fire. The company, which has 20,000 employees, has assured its customers it expects to continue supplying power “without disruption”. On Sunday, PG&E’s chief executive, Geisha Williams, resigned. In a statement issued on Monday, PG&E said it planned to file for bankruptcy protection – under a procedure known as Chapter 11 – “on or about” 29 January. However, it added it was “not going out of business”, and said it did not expect any impact on gas or electricity services for its customers. Shares in the company are expected to fall by more than 50% when trading begins on Monday. Its debt has already been downgraded to junk status, a rating that indicates investors have little faith their money will be paid back. The 150-year-old company said: “We recognise that the devastating and unprecedented Northern California wildfires of 2017 and 2018 have had a profound impact on our customers and their communities. “PG&E faces extensive litigation and significant potential liabilities resulting from these wildfires. It went on to say that a Chapter 11 reorganisation was the only viable option for meeting these goals. Is Your Friend Who They Really Say They Are?